This year is the 125th anniversary of the death of King Ludwig II of Bavaria. The 'fairytale king' or 'Märchenkönig" died at the age of 40 in mysterious circumstances in 1886, when his lifeless body was found floating in Lake Starnberg, south of Munich, together with the corpse of his physician. To commemorate his death, the Bavarian state exhibition titled "Götterdämmerung. König Ludwig II (2011)" has recently been held at Schloss Herrenchiemsee in Bavaria. The UL has acquired the two volume catalogue of the exhibition, which stands at S950.b.201.429-430. There is a wealth of populist literature about King Ludwig II in a variety of different languages and translations, but this is a comprehensive landmark work featuring the most current academic research. It is an important addition to the UL's substantial holdings on Ludwig's life and times. King Ludwig II was born in 1845 and spent most of his childhood years at Schloss Hohenschwangau, a fantasy castle built by his father Maximilian II near Schwansee, Füssen in Bavaria. Crown Prince Ludwig was subject to a strict regime of study and physical exercise and was just 18 when he ascended the Bavarian throne in 1864. During his reign, he was puppet to the political ambitions of the new German emperor, forced to wage war in the name of the new German Empire and reigned as a romantic fairytale king at the height of the Industrial Age. The genealogy of Ludwig II can be consulted in "Wolfgang Raimar : Ahnentafel von König Ludwig II von Bayern (1997)" at 574:4.c.95.335 and the politics of the new German Empire can be explored in "Hans Rall : König Ludwig II und Bismarcks Ringen um Bayern 1870/71 (1973)" at 573:01.c.27.59 and "Christof Botzenhart : Die Regierungstätigkeit König Ludwigs II von Bayern (2004)" at 573:01.c.27.145. Ludwig II is most famous for his building of the fantasy castles Neuschwanstein, Linderhof and Herrenchiemsee, all of which can nowadays be visited by the public. 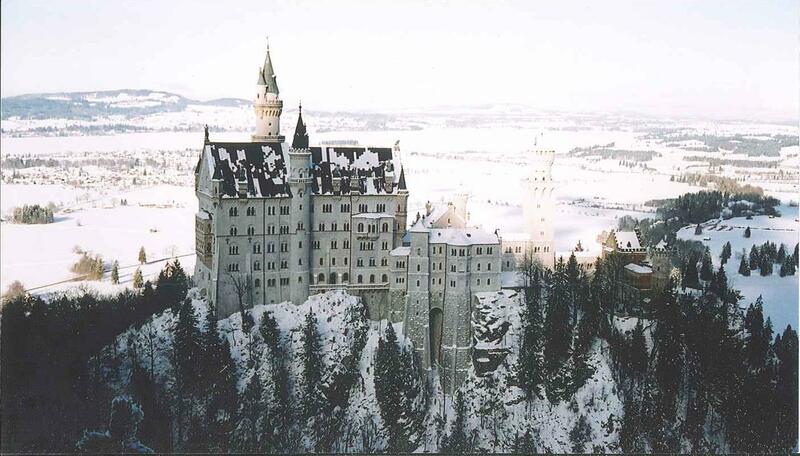 Ludwig was a romantic idealist, a devoted patron of composer Richard Wagner and hired theatrical set designers rather than architects to build his fairytale castles. Unfortunately, he spent most of his time absorbed in his own fantasy world at the expense of affairs of state. When his castle building caused the virtual bankruptcy of the Bavarian state, his ministers accused him of insanity, deposed him on grounds of mental illness and had him committed to the custody of Lake Starnberg castle. This episode of his life is covered by the book "Heinz Häfner : Ein König wird beseitigt (2008)" at 574:4.c.200.56 and "Felix Sommer : Psychiatrie und Macht : Leben und Krankheit König Ludwig II von Bayern im Spiegel prominenter Zeitzeugen (2009)" at 574:4.c.200.89. The king's castles are featured in "Michael Petzet : Gebaute Träume, die Schlösser Ludwigs II von Bayern (1995)" at S401:7.b.9.1076 and the king's so-called madness is questioned in "Wolfgang Schmidbauer : Ein ewiges Rätsel will ich bleiben mir und anderen : wie krank war Ludwig II wirklich? (1986)" at 574:4.d.95.28. The king's secret diaries can be read in "Siegfried Obermeier : Das geheime Tagebuch König Ludwigs II von Bayern 1869-1886 (1986)" at 574:4.d.95.25. The day after his imprisonment, Ludwig II was found dead in Lake Starnberg. He disappeared while out for a walk with his physician Dr. Gudden and his corpse was discovered a few hours later. The death was officially declared to be suicide by drowning, but the circumstances of his death remain open to question. Ludwig was a strong swimmer, the water was less than waist-deep where his body was found and there was no water found in his lungs at the autopsy. Nor does the suicide theory explain the mysterious death of Dr. Gudden. The king's death is documented in "Wilhelm Wöbking : Tod König Ludwigs II von Bayern (1986)" at 574:4.c.95.156 and the mystery is explored in "Peter Glowasz : Wurde Ludwig II erschossen? (1995)" at 574:4.c.95.306. Shortly after his death, Ludwig's castles were thrown open to the public as museums and a cross was erected at the site of his death in Lake Starnberg. A remembrance service is held there every year. The Rumschöttel biography, in particular, is the most recent concise biography of Ludwig's life and times. To many, however, the enigma that is Ludwig II survives to this day.